Pakistan has handed over an Indian pilot captured after his plane was shot down by the Pakistani military this week amid a dramatic confrontation between the two nuclear-armed rivals over the disputed Kashmir region. 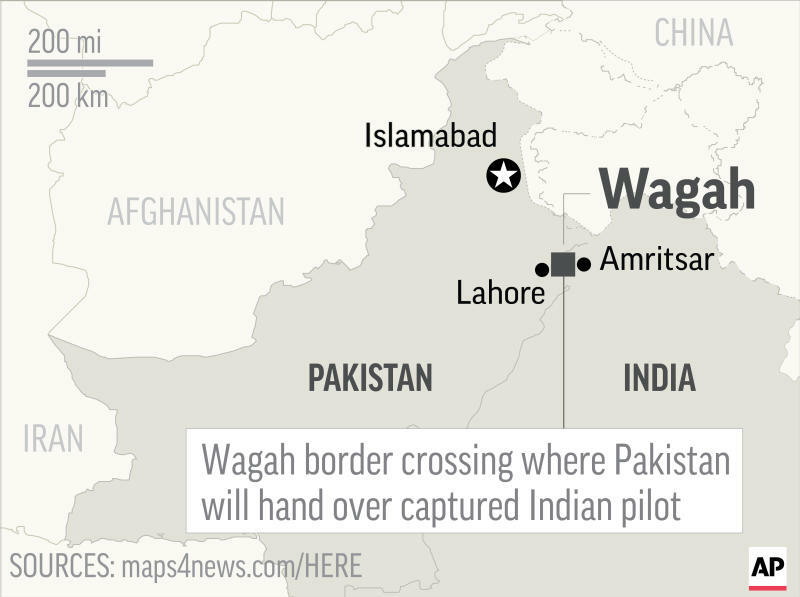 Pakistani officials brought the pilot, identified as Wing Commander Abhinandan Varthaman, to the border crossing with India at Wagah and handed him back to India on Friday. Islamabad has said that the handover was a gesture of peace that could defuse tensions and avoid another war between India and Pakistan. Varthaman was shot down on Wednesday in Pakistani-held Kashmir. India's prime minister says a tough response by his country's armed forces to recent attacks in Indian controlled Kashmir have curtailed the influence of terror groups in the country. Prime Minister Narendra Modi pledged to curtail acts of terrorism further. Modi, who faces elections this spring, spoke at a public rally on Friday in the southern Indian state of Tamil Nadu. Meanwhile, Pakistani officials were preparing to hand over a captured Indian pilot from a plane downed by Pakistani forces amid the worst escalation between the archrivals in two decades. Modi made no mention of the pilot. 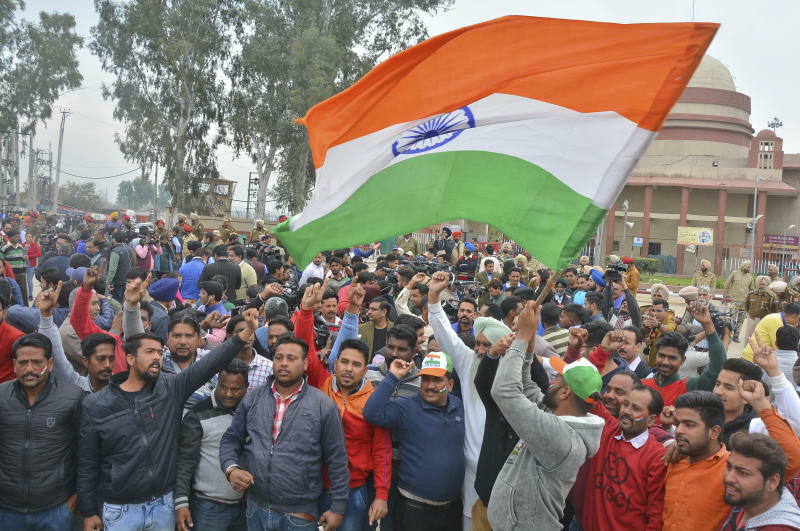 Modi cited the Feb.14 suicide bombing in Indian-controlled Kashmir that killed 40 Indian troops and set in motion the latest escalation and said Indoan soldiers now have full "freedom to do what they want." Pakistani officials have brought the Indian pilot captured from a downed plane to a border crossing with India for handover. 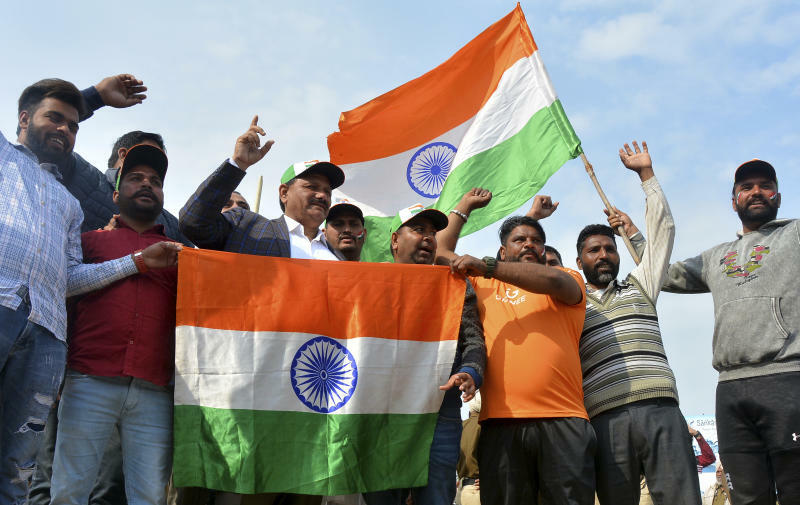 On the Indian side of the border, turbaned Indian policemen lined the road as a group of cheering Indian residents from the area waved India's national flag and held up a huge garland of flowers to welcome him back. Islamabad has said the handover is a gesture of peace that could defuse tensions and avoid another war between India and Pakistan. India has banned a largest political and religious group in Indian-held Kashmir in an ongoing crackdown against rebels seeking the end of Indian rule in the disputed region. India also imposed a security lockdown in several parts of the region on Friday, including in downtown areas of the main city of Srinagar, in anticipation of protests and clashes against Indian rule. India's home ministry issued a notification against Jama'at-e-Islami on Thursday night, accusing the group as "unlawful association" and supporting militancy in the region. Police have already arrested at least 400 leaders and activists, mainly from the Jama'at-e-Islami, which seeks self-determination for the Himalayan region, which is divided between India and Pakistan but claimed by both in its entirety. China welcomes Pakistan's decision to "express kindness" and hand over a captured Indian pilot after four straight days of cross-border attacks in the disputed Himalayan region of Kashmir. Chinese Foreign Ministry spokesman Lu Kang said during a regular news briefing on Friday that "the alleviation of tensions between the two countries serves their fundamental interests." Pakistan said it shot down two Indian warplanes and captured a pilot on Wednesday. A close Pakistani ally, China has blocked India's attempts to have the U.N. list as a terrorist the leader of Jaish-e-Mohammad, a Pakistan-based group that claimed responsibility for a deadly suicide bombing on Indian troops earlier in February in Indian-Controlled Kashmir. In 2017, however, China joined several nations in declaring Jaish-e-Mohammad and another group, Lashkar-e-Taiba, as terrorist organizations. Pakistan's civil aviation authority has partially re-opened the country's airspace, allowing travel to four major cities, another sign that tensions with archrival India are de-escalating. The agency issued a statement on Friday saying all domestic and international flights will be allowed to and from the cities of Karachi, Islamabad, Peshawar and Quetta. It says other airports, including the one located in the eastern city of Lahore that borders India, will remain closed until March 4. Islamabad closed its air space on Wednesday after saying that Pakistan's military shot down two Indian warplanes and captured a pilot, escalating tensions between the nuclear-armed rivals. The closures snarled air traffic. The pilot is expected to be handed back to India later in the day, a move Pakistani Prime Minister Imran Khan has said was a gesture of peace. Pakistan's parliament is reiterating praise for the country's military in responding to India's incursion this week by downing two Indian aircraft and capturing a pilot in Pakistani-held Kashmir. The lawmakers in both the 342-seat Assembly and the 104-seat Senate overwhelmingly passed a resolution on Friday, concluding a joint session that began the previous day over the latest escalation between the two nuclear-armed rivals. The resolution also endorses Prime Minister Imran Khan's offer of talks to New Delhi, saying this is the only way to solve all outstanding issues, including the issue of Kashmir, which is split between India and Pakistan and is claimed by both in its entirety. Pakistani Defense Minister Perfez Khattak told the parliament Islamabad would give a "memorable response" to India if it attacks Pakistan again. Pakistan's top diplomat says he is skipping a meeting of foreign ministers from the world's leading Islamic organization in the United Arab Emirates to protest the host's decision to invite India, a non-member. Foreign Minister Shah Mahmood Qureshi's announcement that he won't be attending the inaugural session of the Organization of Islamic Cooperation in the UAE capital of Abu Dhabi amid soaring tensions this week with archrival India. The escalation between the nuclear-armed rivals over the disputed region of Kashmir has brought them close to the brink of an all-out conflict. Qureshi told Parliament on Friday he decided to stay away from the OIC gathering after UAE's Foreign Minister Abdullah bin Zayed Al Nahyan refused to withdraw the invitation to India's External Affairs Minister Sushma Swaraj. Qureshi says India is neither a member of the 57-nation organization nor has observer status. Pakistan's civil aviation authority says the country's air space remains closed for all domestic and international flights because of continuing tensions with neighboring India. In a statement, the agency said the government decision about the closure of the air space will remain effective until 1 p.m. on Friday, after which authorities will announce whether they are reopening it or keeping the airspace closed. Islamabad closed its air space on Wednesday after saying that Pakistan's military had shot down two Indian warplanes and captured a pilot, escalating tensions between the nuclear-armed rivals. The pilot is expected to be handed back to India later in the day, a move that could de-escalate the crisis. The closing of Pakistan's airspace forced may airlines to reshuffle their flights, causing problems for passengers. Tens of thousands of Indian and Pakistani soldiers face off against each other along the disputed Himalayan border known as the Line of Control in one of the world most volatile regions. Tensions have been running high since Indian aircraft crossed into Pakistan on Tuesday. Pakistan retaliated, shooting down two Indian aircraft and capturing a pilot. World leaders have scrambled to head off an all-out war on the Asian subcontinent. Saudi Arabia's foreign minister is expected in Islamabad later Friday.